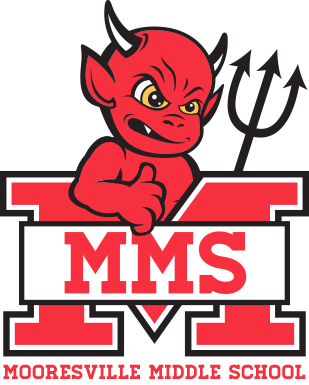 Mooresville Middle School will instill an appreciation and love for learning in our students as we help them develop the skills needed to become goal oriented, independent thinkers and leaders in an ever-changing global society. We challenge every student, every day to discover and develop a positive sense of self, as well as to respect themselves and others through meaningful collaboration with peers, teachers, and parents. Mooresville Parks & Rec is providing financial support to families that are interested in participating in their Summer Camp Programs. Amy parents and families that may have a need for assistance should view the links below. If you have any questions, please contact Marvet Spencer via email or at 704-799-4231. PBIS Rewards Event for students - April 11, 1:30-2:20. Snacks will be sold! Choice of activities outside or movie inside! Our Career Bridge Advisory Council will be holding its annual seminar on April 2, 2019. This seminar is geared toward our middle and high school students and their parents and has valuable information regarding how to plan and smoothly transition from school to college/career. Click this link to see the flyer with the schedule. Click this link to see the session details. All students who attend will receive extra credit by completing a paper survey at the event and turning it in prior to leaving that night. It's that time of year again! As we get closer to registration dates for rising 7th graders, we hope your students consider taking Band at Mooresville Middle School. The Mooresville Middle School Band has a tradition of excellence, and accepts anyone interested and willing to learn how to play an instrument (no prior experience required)! Mr. Gudger, the middle school band director, will be holding two informational nights for perspective students to try out the four instruments that they can start on: Flute, Clarinet, Trumpet, and Trombone. The students can then select the instrument that interests them the most, and sign up for band in the same night! Instrument testing nights will be on Wednesday, March 26th and Thursday, March 27th from 4-7pm in the Mooresville Middle School Band Room.